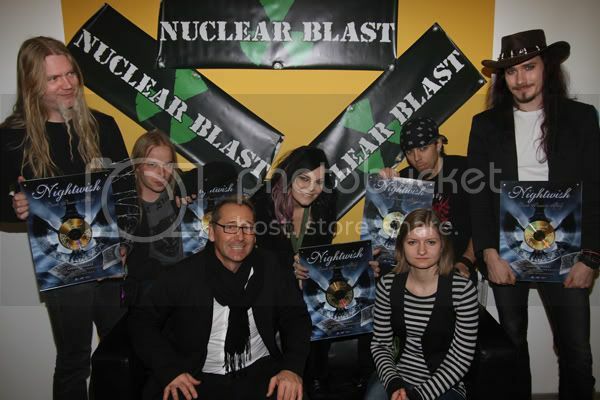 Warner Music Austria presented the Finnish/Swedish symphonic metal band NIGHTWISH with gold-album awards for their latest CD, "Dark Passion Play", on February 28, 2008 prior to the band's sold-out concert in Vienna. The awards were handed out by Warner Music sales director Günter Unter before an audience of 5,000 enthusiastic fans. Check out a photo at this location (left to right: Marco Hietala [NIGHTWISH], Emppu Vuorinen [NIGHTWISH], Günter Unger [Warner Austria], Anette Olzon [NIGHTWISH], Angelika Wuggenig [Warner Austria], Jukka Nevalainen [NIGHTWISH], Tuomas Holopainen [NIGHTWISH]). Fan-filmed video footage from the Vienna concert can be viewed below. NIGHTWISH's latest album, "Dark Passsion Play", has been certified quadruple-platium in Finland for sales in excess of 120,000 copies. The CD has also been certified platinum in Switzerland, and gold in Germany, Sweden and Poland. Emma Gaala will be held on Saturday March 8, 2008 at Kulttuuritalo in Helsinki. NIGHTWISH will perform at the House of Blues in New Orleans, Louisiana on September 20 as part of the third U.S. leg of the band's tour in support of the "Dark Passion Play" album. The trek, which will also include a September 24 date at the Tremont Music Hall in Charlotte, North Carolina, is tentatively scheduled to begin at the end of August and run through the end of September. Final details, including special guest support and on-sale dates, will be officially announced in early April. Discussions have also started to bring the band back to North America in early 2009 for additional touring. Those plans should be finalized by the summer.